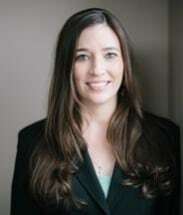 Katie is a partner at Garlington Lohn & Robinson PLLP and chair of the employment law practice group. Katie counsels her clients on employment and labor law issues and has clients representing nearly all industries in Montana. Katie also brings a broad perspective due to her experience litigating civil matters. She is admitted to practice before all Montana courts, the United States District Courts for the District of Montana, the Tribal Court for the Confederated Salish and Kootenai Tribes, the Ninth Circuit Court of Appeals and the Supreme Court of the United States. Katie graduated from the University of Montana, with high honors receiving a Bachelor’s Degree in Psychology and Sociology, with an emphasis in Criminology. She attended the University of Montana School of Law where she graduated with honors. Katie is a native of Lewistown, Montana. Her husband, Matt, is a wild land firefighter and native of Stevensville. Their recreational activities include golfing, rafting, camping, and spending time with their children.